Teeth whitening can give you a smile that you want to show off. It can make you feel and look more confident and attractive. That’s why so many people visit their dentist for some type of whitening treatment. Here at Paramount Dental Sydney, we offer teeth whitening treatments that can be performed in the surgery or at home. These two systems both have their benefits, and it can be difficult to choose between them. But we’d like to help you with that with our easy guide to whitening solutions. You can also get a dental treatment that will whiten your teeth at home. 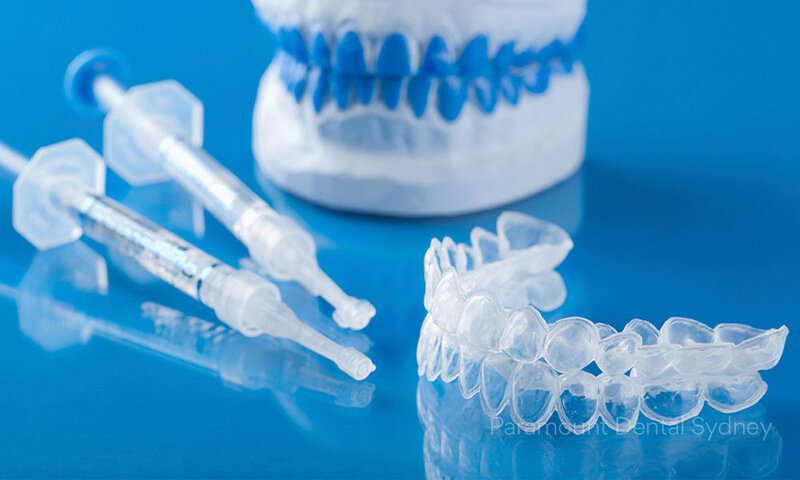 If you choose this treatment, your dentist will take a mould of your mouth and make a tray that fits over your teeth. At home, you fill the tray with the dentist’s bleaching solution and fit the tray to your teeth for 45 minutes. This treatment must be applied repeatedly over 7-14 days and it will noticeably whiten your teeth over this time. There are several types of toothpaste available at grocery stories that claim to whiten your teeth. These can be helpful if you’re really concerned about the colour of your teeth, but they’re not nearly as effective as dental whitening treatments. If you choose to get a whitening treatment in the office, your dentist will apply a bleaching gel to your teeth and leave it in place for an hour while it works. At our office in Paramount Dental Sydney, you can relax back in our comfortable chairs during the treatment and listen to music, or watch movies or a television show on one of our ceiling televisions. This treatment is highly effective, and will make your smile around 5 shades lighter instantly. If you get your teeth whitened in the dentist’s office you will be there for one session that lasts at least an hour. If you choose to take your whitening treatment home, you will spend less time in the dentist’s office, but the treatment itself will continue for several days. The best option for you in this respect will depend on the demands of your daily schedule. Whitening treatments in the office typically cost more than the at-home treatments, though the actual amounts can vary depending on your dentist, and on your insurance plan. So if cost is a concern for you, the take home treatment might be the right choice for your whitening needs. If you have your teeth whitening treatment in the office, the result will be brighter, whiter teeth than with the take home treatment. This is because of the strength of the bleaching gel. If you choose the home treatment you will be without oversight during the procedure, so the gel must be milder and safer. This results in a slight difference between the results of the two treatments, so if this is a key concern for you, you need to choose accordingly. For a smile that’s really worth showing off, make an appointment for a whitening treatment today with our staff at Paramount Dental Sydney.